← This Guider Asks: What Activities Are You Planning This Year? A few weeks ago, guest blogger and Brownie Guider Sarah of Dartmouth, Nova Scotia, wrote for us what turned out to be a very popular post about the importance of her camp blanket in her Guiding and non-Guiding life. We just had to have Sarah follow-up with this unofficial ‘part 2’. We were so inspired that we also started a Flickr photo set of camp blankets! Will you send us yours? When I became a Brownie leader, right before we went to camp, I always brought my camp blanket to a meeting. This was a great way to start a conversation with the girls about camp, WAGGGS (I have several international crests and scarves on my blanket) and to get them excited about moving up to Guides, Pathfinders, Rangers and hopefully into being a Brown Owl one day. It was a great tool because the girls could see and feel things; it wasn’t just me talking to them about it. After a year or two of noticing that the girls (and parents) didn’t totally understand the difference between a program badge and a crest, I started to bring the blanket out earlier in the year. And then I decided that the girls should have their own camp blankets to bring to camp that year. I did what every good, young leader does – I enlisted my mom! She was never a Girl Guide or a leader, and truthfully my weekly Unit meetings were as much a break for me as they were for her! But she has always helped out whenever I’ve asked, enjoying her time with my Unit. My mom is super crafty, a gene that I can say is not hereditary. And I’m guessing since it wasn’t an activity that involved making me a FOURTH camp blanket, she was on board. As the parents dropped off their girls for the first night, I had my blanket out, and my plan hatched. I explained that we would be doing this, working on it throughout the year, and the approximate costs. (What I lack in arts and crafts DNA, I more than make up for in bargain hunting.) In the end, it was no more than $10 per girl for their blanket. We opted for a micro-fleece material because it’s lightweight, and we didn’t need to finish the edge. We cut a hole in the middle to make it into a poncho, and generally cut it to the size the girls could grow into and take onto Guides. I hope this helps you create camp blankets with your girls. As many commentators said on the last post, our blankets are very important to us – let’s make sure the next wave of girls feel the same way! Where the photo of your camp blanket? Send us a photo to marketing1 (@) girlguides.ca and we’ll upload it to our Flickr photo set of camp blankets! This entry was posted in Awesome Activities and tagged brownies, camp, camp blanket. Bookmark the permalink. I was a Sparks leader and now I am a Brownie Leader. After our winter camp last year, I noticed that none of the girls had a blanket or knew what a camp blanket was. So I spoke to the other leaders and we decided as part of Advancement our Sparks would get a new camp blanket with a few fun badges to get them started. We are going camping in the new year and I am looking forward to seeing all these blankets. Kermit, we are so lucky to have you and the other ladies as leaders for our girls. the blanket has been such a hit in our house ans much time and discussion has already gone into which badges go where. We can’t wait to show you our efforts at the first camp. You have even inspired me to get my blanket out of storage in Australia and bring it home! I am just getting around to sewing all my crests onto the camp blanket I bought 2 years ago. I want to do one with the girls as well. I love that you have you scarves from your girl years on your blanket it has inspired me to do the same! I just wish my mom hadn’t lost my badges!!! I agree! I was a Spark Guider last year and ‘Santa’ gave all the girls a camp blanket – $2 fleece blankets from the Dollarama are just the right size for Sparks. We asked the parents to do the cutting and many of them did. By camp in June we had quite a few girls in camp blankets. 🙂 They loved them, and many vowed to fill theirs up like mine! Love the post about the badge blanket. I’m a Guide Guider in the UK and use my blanket as a talking point for my Guides. I love my camp blankets… yes blankets… I now have 3… two are totally filled, and I’m working on my third. 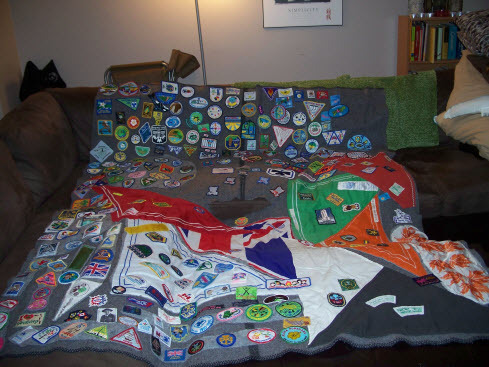 I remember being a brand new leader (over 16 years ago), and seeing another Guider’s blanket… I went to the Guide Store and that started the crest addiction! LOL I even had my balnkets on display at our local Guide Store (before we switched to online shopping), and the girls love looking at all the different crests from all over the world. Blankets are an amazing teaching aid, and I encourage all my Brownies (and now Guides) to get blankets… I even suggest to parents to get them as gifts for the girls. I made many wonderful Guiding friends all over the world when I was swapping crests, and I remember every stitch on every crest I stitched on, and at any Guiding function, they are a conversation piece! I encourage everyone to get a blanket… you won’t be sorry! I grew up in Brownies and Girl Guides in Australia, and am now a Youth Leader of Girl Guides (10 to 14yr olds) in Guided myself. My campfire blanket has my Mums old Brownie badges, all of my Brownie and Guide badges, plus swap badges on it, and my daughters, who at 3yrs of age aren’t old enough to join already have campfire blankets of their own. I remember seeing Brown Owls blanket at camps, and I was always in awe of the number of badges she had. I bring my own blanket out when we do nights on Guiding traditions, and it’s part of my standard camp kit. When I was in Sparks, my mum (also my leader) and the other Guiders made all the girls a camp blanket out of fleece. I’m now a new Guider myself, and have been adding to my blanket since Sparks.